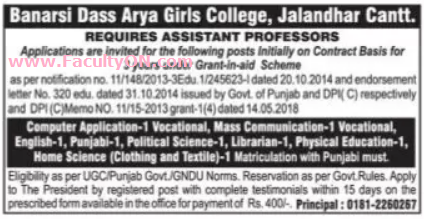 Banarsi Dass Arya Girls College, Jalandhar Cantt has advertised in Tribune newspaper for the recruitment of Assistant Professor jobs vacancies. Interested and eligible job aspirants are requested to apply with in 15 days. Check out further more details below. About College: Banarsi Dass Arya Girls College on Haqiqat Road Jalandhar Cantt is one of the leading educational institutions of Jalandhar. It has many locational advantages. It is away from the din and pollution of the city. Being in proximity to the bus stands of both city and Cantt. and the Jalandhar Cantt. Railway Station, it is easily accessible to the surrounding rural and urban areas. The locale, setting and the serenity of the environment makes it an ideal educational institution. It is a boon for the wards of defence personnel of Jalandhar Cantt.